Slide #7 from Rob Johansson’s ag outlook forum speech on 2/23/18. Click this image to view a larger version. Last week, nearly 1,600 agriculture stakeholders gathered at the 94th Annual Agricultural Outlook Forum, the USDA’s largest convening. U.S. Agriculture Secretary Sonny Perdue and other distinguished speakers shared their insights on upcoming challenges and opportunities in agriculture, including infrastructure, regulatory reform, industry, governance, and farm policies. I had the honor of presenting the 2018 Agricultural Outlook. While the U.S. ag arena faces challenges due to low income and commodity prices, there are some promising trends that may shape global demand for American-grown food, fuel, and fiber. According to the International Monetary Fund, global economic activity continues to grow, and will stabilize over the next few years. That should help boost demand. In fact, global purchasing power over the next two years has expanded $325 billion compared to when we completed our December estimates. Global income growth will drive increased global demand in U.S. agricultural products. 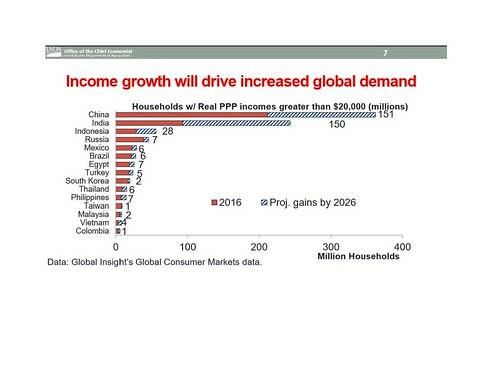 Much of that growth will be in developing and emerging economies that are projected to see a significant increase in the number of middle-income households. With growing numbers of middle-income households, we expect demand for U.S. livestock and dairy products to also expand. Moreover, demand for the grains and oilseeds that make up livestock feed and processed products will also grow. Where are these new middle-class households? In China, the number of middle-class households will nearly double, approaching 370 million households by the year 2026. To put that in perspective, the entire U.S. population is 327 million. Additionally, the number of middle-class households in India is expected to nearly triple by 2026. While more households entering the middle class are important for boosting overall food demand, so are new trading agreements that can open up new markets for U.S. grown and produced food. We continue to look to growing trade in food products and new markets for U.S. products as a critical outlet for accommodating growth in U.S. ag productivity and production. Those markets boosted by growing economic growth can sustain U.S. farm incomes over the long run. NOTE: View presentations by Rob Johansson and other plenary speakers at the Ag Outlook Forum website. All the presentations from the Thursday sessions and Friday sessions are also available online.